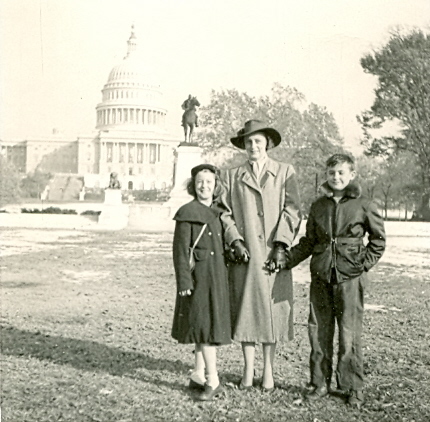 My mom, grandmother, and uncle on the National Mall in Washington, D.C. in 1953. Maybe you’ve got an old photograph on your piano of your mother when she was a girl, that day she took a trip with her family to the U.S. Capitol in Washington, D.C. Or maybe you remember that great story your grandmother once told you about meeting your grandfather at a USO dance. I still remember my great-aunt telling me about working the air traffic control tower of her regional airport during World War II because all the men were deployed. Go to the source. If you’re fortunate enough to have older relatives still living, pay them a visit! Or at least a phone call. Ask them to tell you anything they can about their youth, their parents and grandparents, and the times they lived in. What kind of car did they drive? What did they do for work during the Depression? What are some of their favorite memories of their childhood? Take a notebook—or better yet, a video or audio recorder. These stories are priceless! And if they have a stash of photographs or scrapbooks, ask if you can take a look. Draft a tree. Start with your parents and grandparents. Note their dates of birth and death, when and who they married, and where they’re buried. How far back can you go? Don’t worry if you have more information for one branch of your family tree than another, and don’t worry if your tree is largely bare at this point. Filling it in is the fun part! Go online. Now you can start exploring your family tree on Ancestry.com—it’s easy and just as private as you want it to be. Again, start with what you know, then search for possible connections in preceding generations. Go online some more. Try Googling the names of your grandparents, great-grandparents, and other ancestors as far back as you can go. There’s so much genealogical information online, and more being digitized every day, there’s no telling what you’ll turn up. Scavenge for facts. Does your family have any old scrapbooks or photographs you can look through? Check inside the front cover of your grandmother’s old family Bible—there’s probably a trove of names and dates recorded there. Talk to your cousins—do any of them have material that could help fill in gaps in your tree? Do your legwork. Visit the historical societies in the town(s) where your ancestors lived, and the libraries where their hometown newspapers may be archived. Stop in at the churches where they worshipped and ask if you can look for your ancestor in their records of baptisms, marriages, and deaths. Be sure to keep detailed records of everything you find—preferably photocopies. Talk about it! Tell your friends and relatives what you’re doing—you never know where your next lead or research strategy might come from. Educate yourself. Subscribe to genealogy blogs and other websites that offer research strategies. One of the fun blogs I follow is Out Here Studying Stones, whose author one day suggested searching for an ancestor’s passport application on Ancestry.com. I’d never thought of it! I knew my great-grandparents had been to Europe in 1909, so I searched for my great-grandfather’s passport application. Bingo! Within five minutes I had his childhood address and his hair and eye color—information I’d not been able to find previously. Here’s a nice free tutorial on Family Search, a site operated by the Church of Jesus Christ of Latter-Day Saints. Here’s another that explains how to use the National Archives for doing your research. Here’s another, from the National Genealogical Society. And here Family Tree magazine lists the top 40 genealogy blogs for 2013. Share what you know. As you develop knowledge about your family and expertise about researching it, consider sharing what you’ve learned, whether in a blog or a self-published family history book. Giving people the opportunity to respond to your work will help you develop your skills—and could take your research off in new and fruitful directions. You can start by letting us know some of your research strategies and successes, right here in the comment box below! These tips for getting started are WONDERFUL, Chris – and look to be fairly simple. I had all but forgotten that in 2005, when my husband and I were living in Georgia, my mother came to visit for a few days. She had expressed an interest in looking more into her family history, and I had heard about Ancestry.com. I have notes on the beginnings of our research on the site; and though I do not recall what it was exactly, I do remember having difficulty moving beyond a certain point – and we weren’t very far in! Now that I have these additional suggestions, I think I will try some more digging on my own ~ and maybe I can turn up a few things to surprise my mom! 🙂 Thank you!